Gates promotes problem solving and teamwork through sponsorship of First Robotics Competition Colorado Regional Competition at the University of Denver. Rebound Rumble featured robots equipped with Gates power transmission belts. Gates continues to be committed to providing these young people with opportunities to build on their innate talents and interests in the STEM disciplines through critical educational programs such as FIRST Robotics. On March 23rd, 1,000 students from Colorado, surrounding states and Mexico had the opportunity to showcase their hard work after an intense six weeks of designing and building an original robot in the 2012 FIRST Robotics Colorado Regional Competition, sponsored in part by Gates Corporation. Gates, a Crown Supplier for the FIRST Robotics Competition (FRC), entered its sixth year providing support in the form of over $500,000 worth of power transmission products to be used by students to design and build robots which were then tested in last Friday’s regional competitive games. Held at the University of Denver’s Ritchie Center, the regional competition included 48 student teams that demonstrated their skills in science, mathematics, and technology in competition for honors and recognition that reward design excellence, competitive play, sportsmanship, and high- impact partnerships between schools, businesses and communities. FIRST competitions offer young competitors a chance to experience the excitement of science, technology, engineering and math (STEM), and to discover the potential rewards a career in these fields can offer. Now in its 21st season, FIRST Robotics Competition includes more than 2,343 teams of high-school students from the U.S., Australia, Brazil, Canada, Chile, Dominican Republic, Germany, Israel, Mexico, Taiwan, Turkey, and the U.K. who will compete in 52 regional competitions similar to the Colorado event. This year’s competition started in January when student teams working with professional engineering mentors received a standard kit of parts and set of rules. Gates contribution to the kit included power transmission belt drive systems. 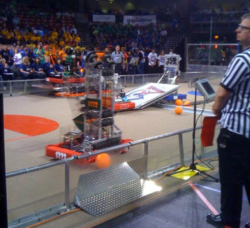 The teams then created and programmed robots that would compete in the 2012 Challenge “Rebound Rumble”, a game based on basketball played on a field containing obstacles. The competition measures the effectiveness of each robot in the game, as well as the teams’ collaboration skills. “Rebound Rumble” is played between two Alliances of three teams each. Each Alliance competes by trying to shoot as many of the basketballs into the four hoops as possible during the two-minute and 15-second match. Team Alliances were also able to earn bonus points if they could place their robot in a specific location at the end of the match. For more information contact Mari Jane Panek 303.744.4533 or mjpanek(at)gates(dot)com. Gates Corporation (gates.com) is one of the world’s leading manufacturers of industrial and automotive products, systems and components with operations in 30 countries. Gates maintains sales and marketing operations in every major industrial and automotive market, including North and South America, Europe, Asia, Australia and the Middle East. Gates is part of the Industrial & Automotive group of Tomkins Ltd., which is owned by a consortium comprising Onex Corporation and the Canada Pension Plan Investment Board. Tomkins enjoys strong market positions and technical leadership across all of its business activities and owns some of the best-known brands in their respective markets. Based in Denver, Colo., ColoradoFIRST is a 501(c)(3) non-profit founded in 2007 to regionally represent and achieve the mission of FIRST. The organization seeks to advance the mission of FIRST on a local level by hosting and promoting events that allow students to demonstrate their skills for science, technology, engineering and mathematics and reward design excellence, competitive play, sportsmanship and high-impact partnerships between schools, business and communities. For more information about ColoradoFIRST, visit its website and follow the organization on Facebook and its Twitter account. Accomplished inventor Dean Kamen founded FIRST® (For Inspiration and Recognition of Science and Technology) in 1989 to inspire an appreciation of science and technology in young people. Based in Manchester, N.H., FIRST designs accessible, innovative programs to build self-confidence, knowledge, and life skills while motivating young people to pursue opportunities in science, technology, and engineering. With support from three out of every five Fortune 500 companies and more than $14 million in college scholarships, the not-for-profit organization hosts the FIRST® Robotics Competition (FRC®) and FIRST® Tech Challenge (FTC®) for high-school students, FIRST® LEGO® League (FLL®) for 9 to 14-year-olds, (9 to 16-year-olds outside the U.S., Canada and Mexico) and Junior FIRST® LEGO® League (Jr.FLL®) for 6 to 9-year-olds. Gracious ProfessionalismTM is a way of doing things that encourages high-quality work, emphasizes the value of others, and respects individuals and the community. To learn more about FIRST, go to http://www.usfirst.org.